We say that flooring is like the canvas that you paint the room on top of. To end well, you have to start well. This article will help you to understand how flooring is done and what improves the value of your home. Flooring styles and flooring ideas have changed a lot over the years. Thirty years ago, home owners enjoyed beautiful herringbone pattern hardwood floors, and then that style went out of fashion, and we started installing carpet on top of them because all of a sudden, carpet was ‘classy’. Some homes now have two or three different carpet colors and styles that were installed over the years. Others have ceramic floors, vinyl, and old outdated flooring mixtures throughout. Your floors are part of a buyer’s impression picture, and a considerable expense if they have to be replaced or refinished. If you decide to change an existing floor, be careful making a snap decision, and then starting without first performing an investigation. There may be more than one or two materials underneath the existing flooring. In these cases, it’s a big job to pull everything up to the sub-floor, and then sometimes discovering a new sub-floor is required once you get there. This can add to the new floor expense, but it may have to be done before a new floor is installed. If you are changing your existing vinyl or ceramic floor material to solid wood flooring, you must start with the proper sub-floor. A Potlach™ or particle board sub floor is not acceptable if you are going to use a nail down installation method for your strip flooring. It is acceptable if you are gluing it down though. If you hear old, thin, and well tread 3/8” wood flooring squeak, it could be approaching the end of its service days. If you see nails, it means the floor material has been sanded too many times. If you see the splits between the wood strips; that means the groove edge holding it together has broken off. Filling it with compound won’t solve the problem. It will just ‘pop out’ again. The best course of action here, is to lift up and replace the wood floor covering. If the hardwood is in good condition, but the color has faded or streaked, then sanding and refinishing produces great results. Darker finishes also cover up older wood imperfections. 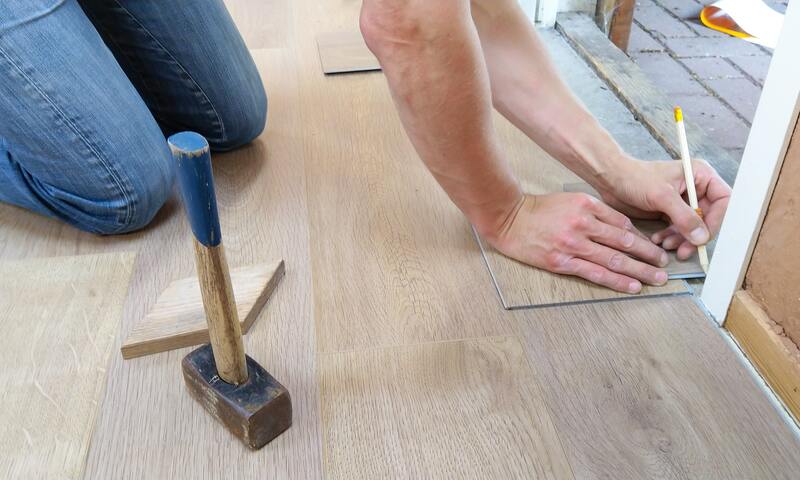 When it’s time for replacement though, installing new pre-finished flooring is straight forward and simple for an experienced flooring contractors. The big question is; do you choose an engineered type or solid strips? While both types look nice, and generally perform exceeding well, there are some important differences to be aware of. Solid wood flooring is just that – solid. It’s one continuous piece of material. Engineered flooring is made up of opposing layers of material that prevent it from warping or moving. Both products can even look the same once they are installed, but they are both unique. First, moisture affects both floor substrates differently. The solid flooring will be more susceptible to changes in temperature, and can react quite dramatically by shrinking, or expanding to where you don’t want it to go. This means that you should avoid solid strip flooring in basements and bathrooms and laundry rooms. A laminate floor is another popular upgrade. This type of material sits on an underlay membrane and ‘floats. The floating property makes it easy to install over other intact floor surfaces. If you have dogs in your family, laminate flooring should be your first choice, as their dog nails scratch and natural wood can get marked up very easily. Vinyl is making a big comeback as well. Advances in digital printing allow manufacturers to print wood, marble or any other material onto the sheeting and the results are more than impressive. Thin vinyl flooring, sheet, or individual tiles can be installed right on top other flooring, ‘loose laid’ or glued down. Dave’s Toolbox TIP: If you live in a condo, your new flooring has to be approved by the board, with a specific sound reduction STC## / IIC ## rating. Get this approval before proceeding. If you haven’t been shopping for ceramic tile in a while, you will be impressed when you see what’s available today. The first thing you will notice is how big the tiles have grown. Big is in. 12” x 12” tiles are still available, but larger 12” x 24” tiles have overtaken them in popularity. Another new advancement is in the tile finishes. Like the newer vinyl sheet product, ceramic and porcelain tiles are all now covered with digital screen prints that mimic marble, wood and concrete so closely, you will be hard pressed to tell the difference without a magnifying glass. Regardless of the flooring you eventually choose to improve, if you replace any coverings, you will need to install new baseboard, ¼ round, or shoe molding at the perimeter. While doing so, you need to be careful that you keep floor levels as even as possible, because if you start to raise the levels, you will need transition strips where one room joins another. Recently, an agent brought us in to a project home to give him some ideas on what could be done to a very ‘loud’ ceramic floor in a front hallway and kitchen of one of his listings. His client did not have much of a budget for new floors, so we filled the grout lines with a special floor compound and laid a new vinyl floor right over it. The job came out flawlessly. We added a new quarter round border, painted, and for a small investment he had a bright and inviting entrance to welcome prospects. Flooring is not easy and has to be done by experienced contractors. Prep’n Sell can help you deliver the whole project with minimal supervision and on time. Give us a call or fill out the ‘request more information’ form on this page. We will be happy to help you out with your project.